There are two things we take very seriously around here: birthday parties and fun family time. 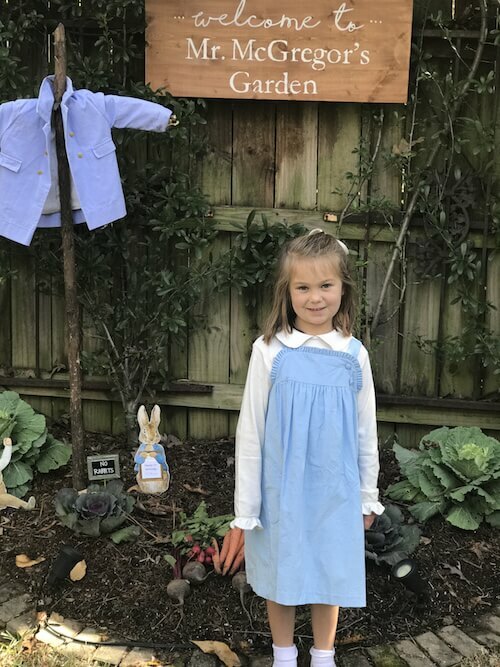 We had the perfect spring break “staycation” this month when our family hit the theatre to check out Peter Rabbit™, a fun movie for all ages, then headed to the best Peter Rabbit birthday party I’ve ever seen. 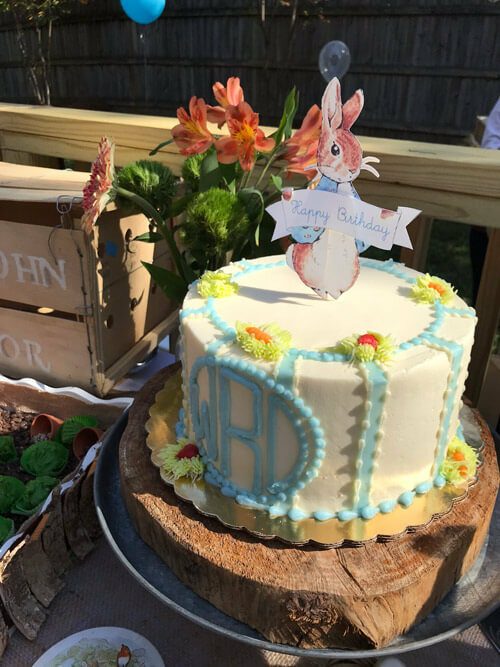 My friend Meredith Rehm threw an adorable bunny themed party for her son’s first birthday, and it’s giving me all sorts of ideas for my next party! 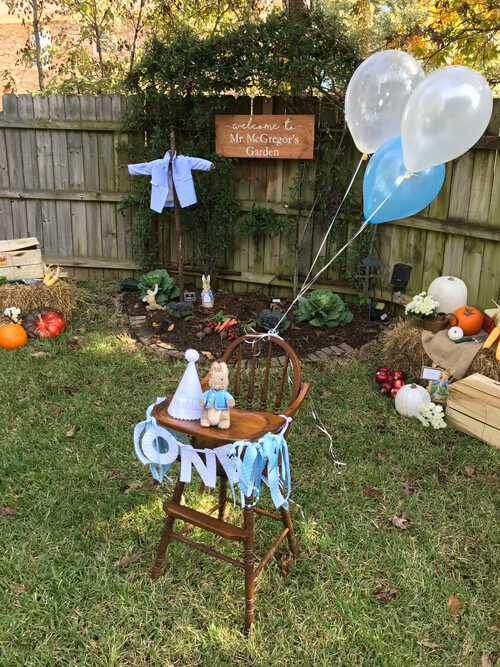 Lucky for us, she’s shared all the details here so that you can get inspired for your next family birthday. 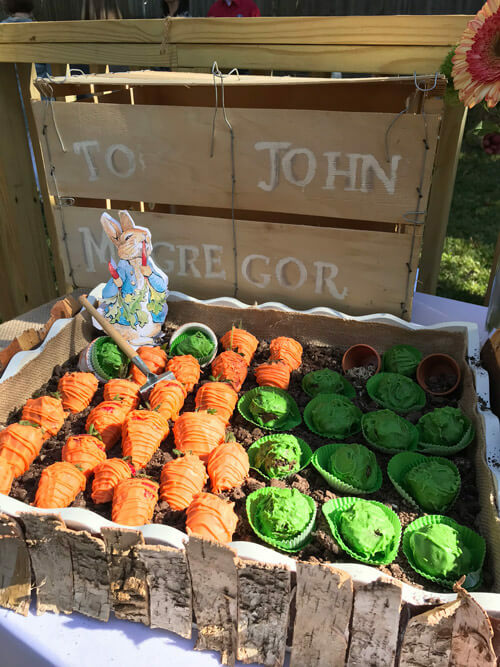 Whether you choose to go all out and recreate the entire party or simply pick one or two ideas to try like the DELICIOUS Candy Dipped ‘Strawberry’ Carrots and Peter Rabbit ‘Cabbage’ Oreo Truffles (psst…scroll down to find them! 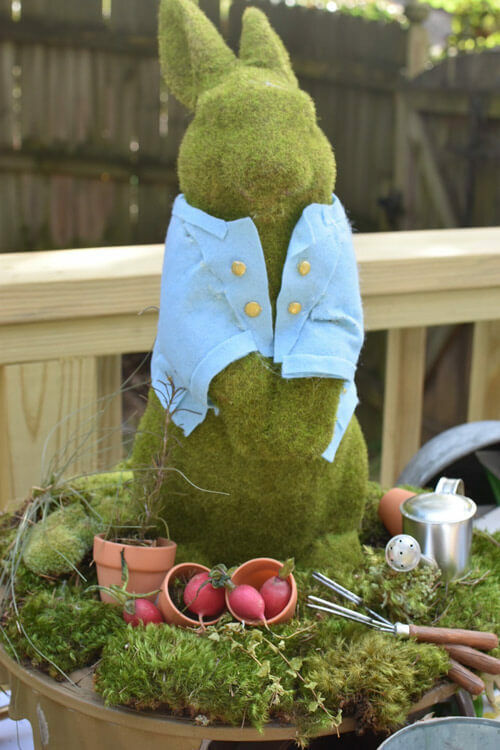 ), let these ideas whisk you away into the world of Beatrix Potter. 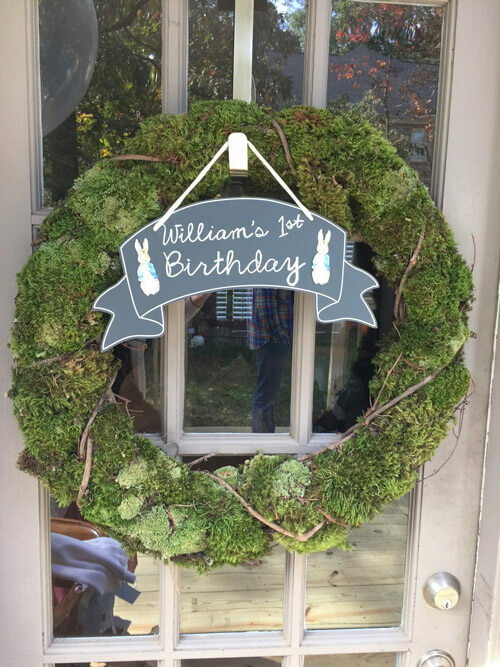 This party welcome scene is so simple and clever that you can pull it together in minutes. 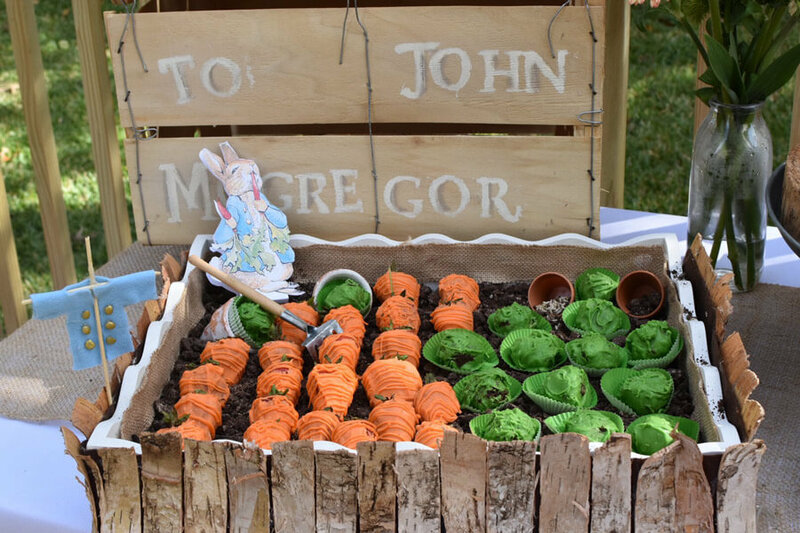 The fresh veggies and cut outs set the scene for a fun party for all ages. 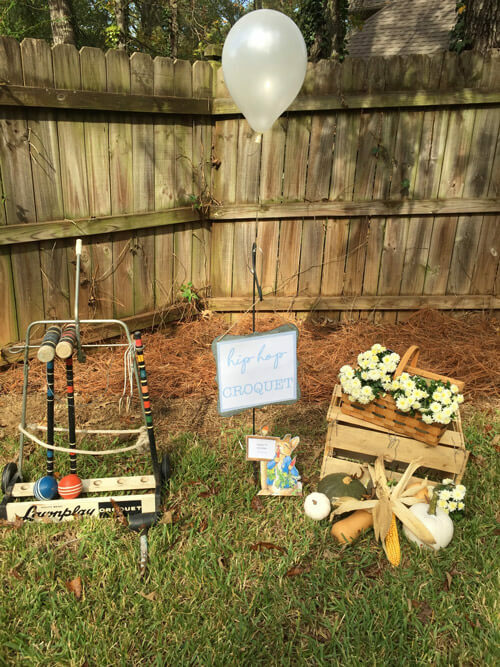 I love how she used her backyard beds to create a picture-perfect setup for the party. 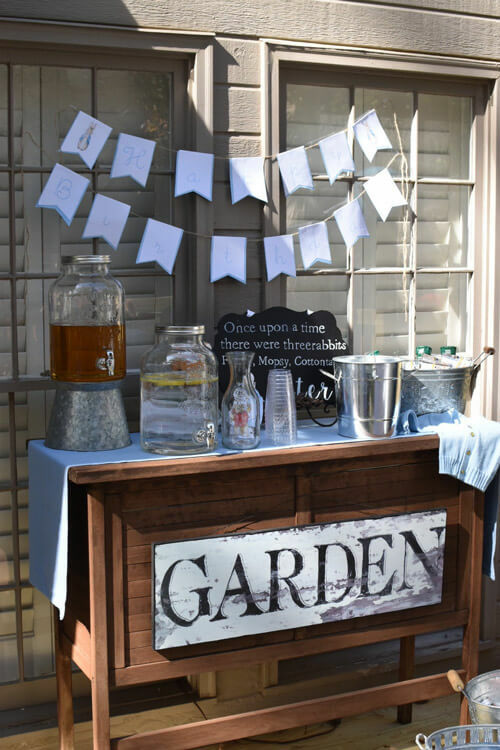 Every party needs a refreshment station. 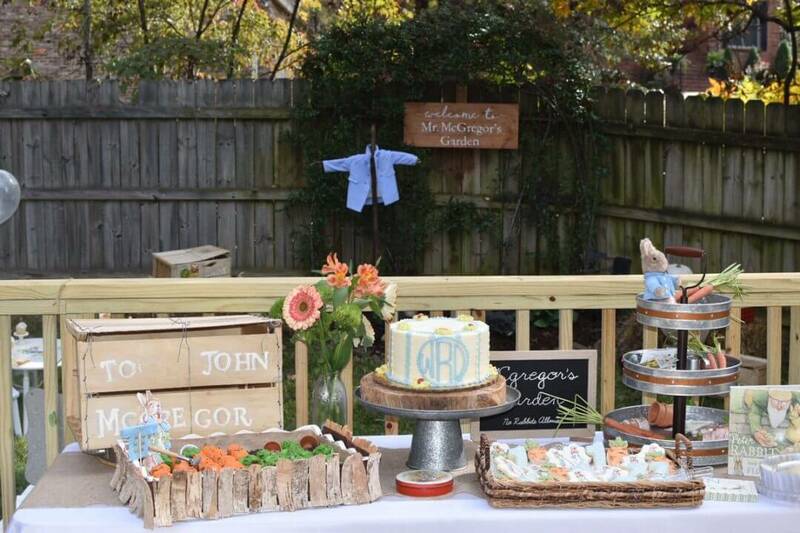 The blue table runner and Peter Rabbit pendant banner tie the theme together perfectly. Serve beverages that suit your age group, including any adults along to help out. Even ho-hum water bottles look spiffy with these rabbit-themed wraps. 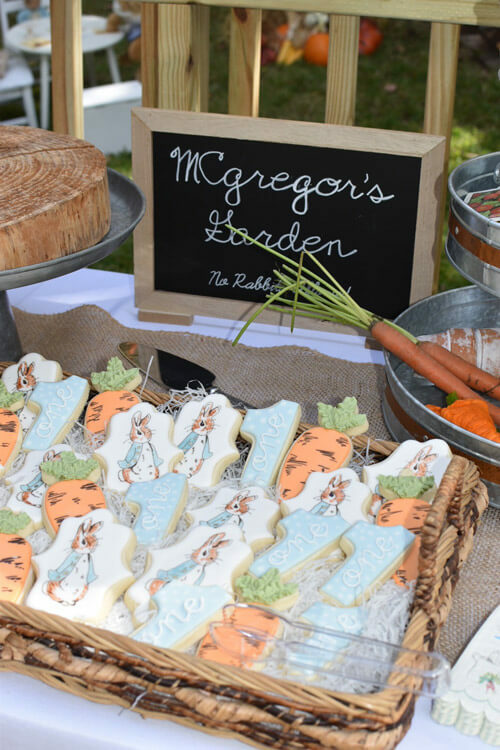 Too-cute cookies made by a local baker tie all the elements of the theme in flawlessly. When ordering cookies, ask for a variety of shapes and colors that blend well but also speak to your theme. For a first birthday, the number one was a perfect touch. Candy-dipped strawberries masquerade as carrots while Oreo truffles disguised as tiny cabbages are served on a bed of “dirt” (crumbled cookies!). The colored candy melts bring fun imaginative play to the party and help your kids to play fun “tricks” on each other. 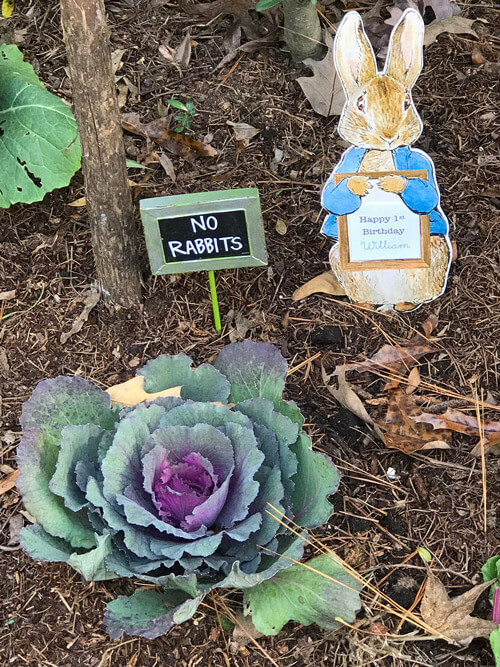 Encourage them to try the “cabbage” and see how they like it. 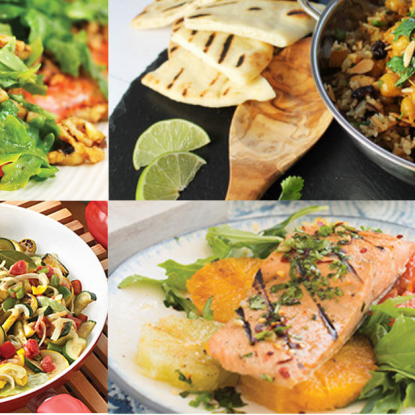 Meredith shared her recipes, which you’ll find below! 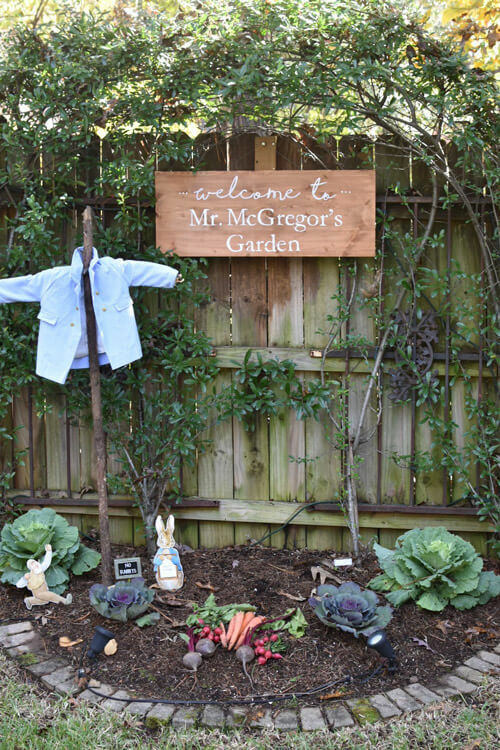 She attached a DIY wooden garland to a white serving tray to stick to her garden theme. 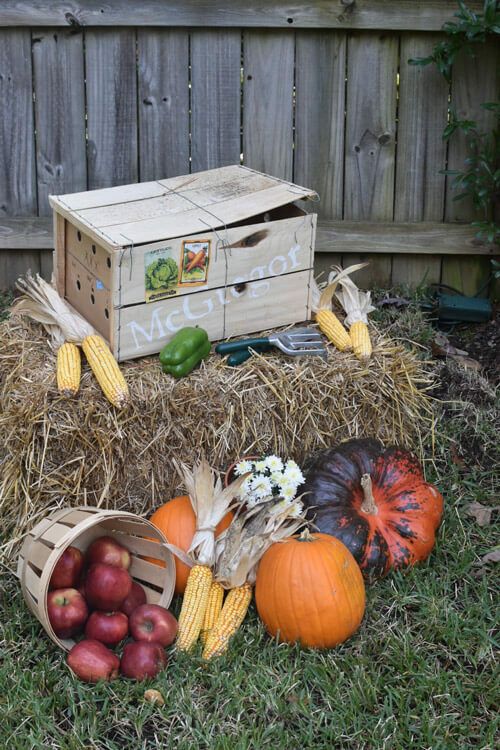 Make it your own by attaching local tree bark around the tray (time to warm up the glue gun! 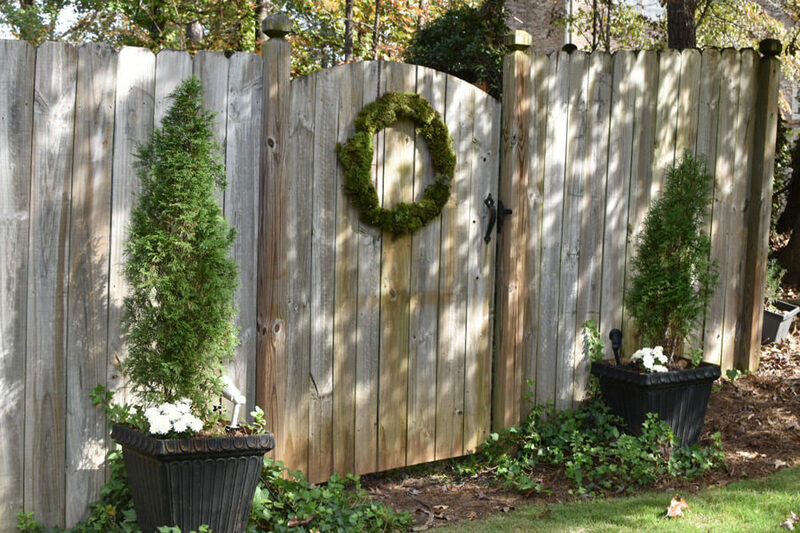 ), or swapping in popsicle sticks to resemble a fence around the garden. 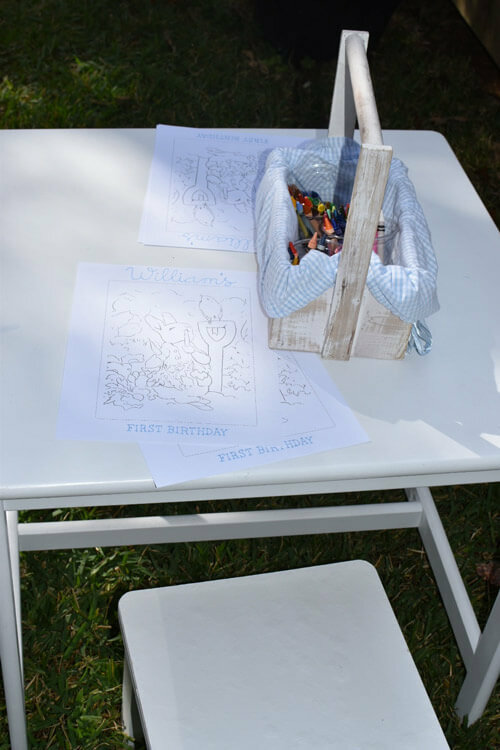 Printables help tie party themes together, and topping a cake for a one-year old with one is smarter and more fun than adding a candle. Take your invitation or a sample printable to the bakery so they can match your colors. 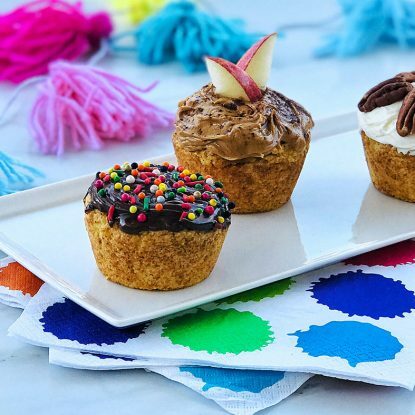 If you prefer cupcakes, order these adorable liners ahead of time. Top them with edible carrot candies for easy decorating. Every party needs cups, plates, and napkins, so plan ahead and grab a set that makes your theme shine. 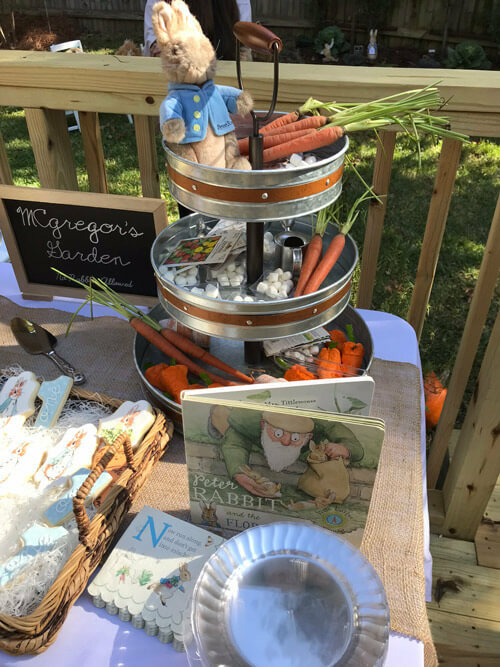 This bundle makes a Peter Rabbit birthday party party a breeze (Bundle of Stuff), but you can also buy individual plates, napkins, and cups if you don’t need a whole set. Looking to cut costs? Pick up plain plates in your theme’s color then splurge for cute napkins; after all, the plates will quickly be topped with tasty treats. 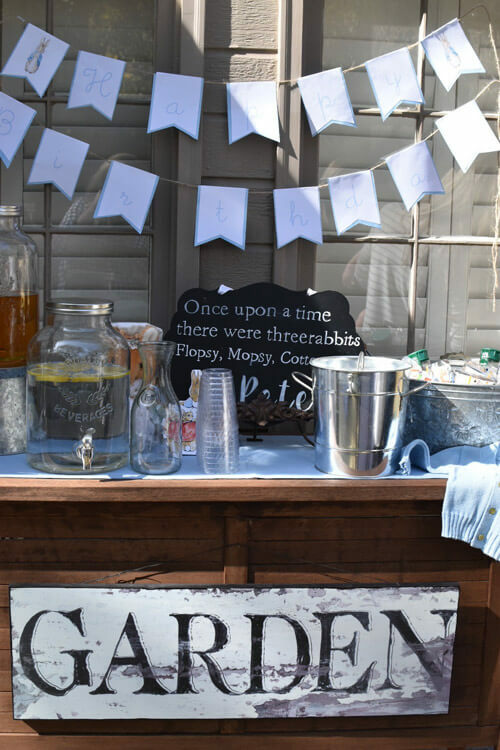 A garden-themed party makes it easier to keep the menu fresh and healthy. Roll ups are a great place to start. Wrap turkey and cheese in a whole wheat tortilla, or roll up peanut butter and jelly for an easy grab-and-go snack for distracted party guests. 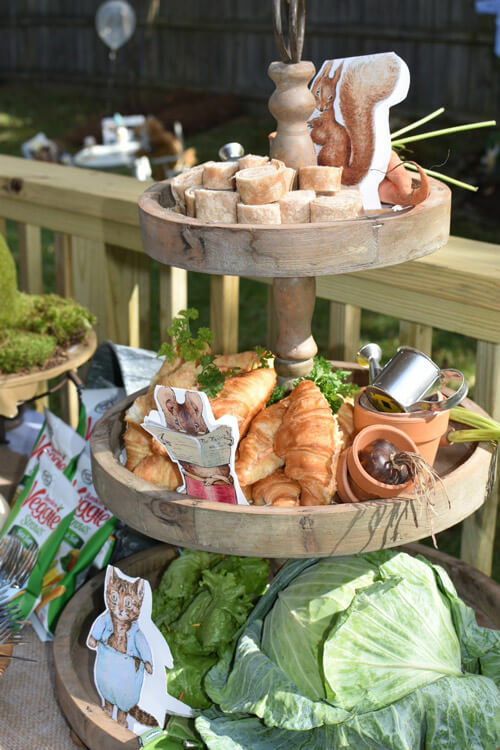 Chicken salad in lettuce leaves (use Bibb, Romaine or iceberg) and croissants stuffed with pimiento cheese round out the menu while tiny plant pots stay true to the theme. Give my Balsamic Chicken Salad and Lightened Classic Pimiento Cheese a try. 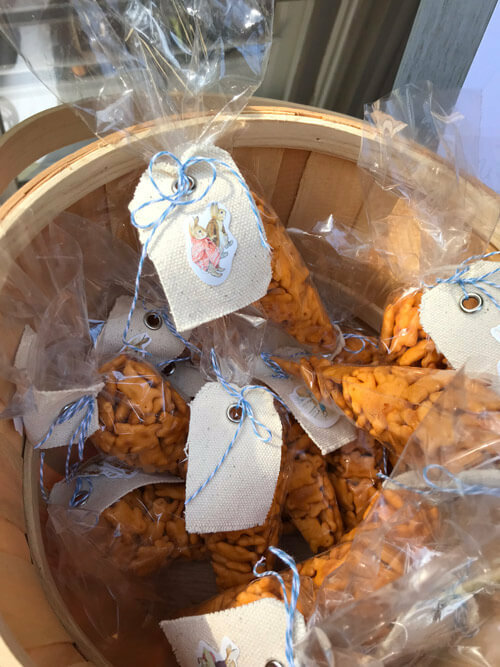 All pint-sized guests love a goodie bag. Fill yours with cheddar bunnies to stay on theme and skip the post-cake sugar overload. 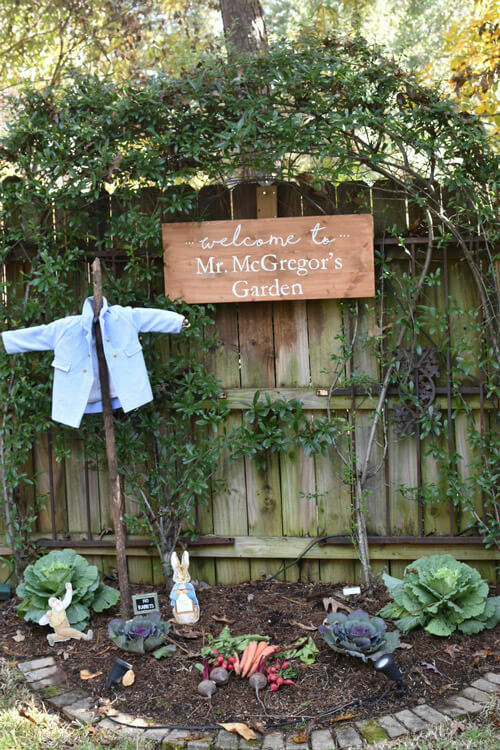 If you prefer a non-food gift, pick up mini gardening tools or watering cans for a fun take-home item. Finely chop cookies in a food processor. Transfer to a large bowl. Using your hands, combine cookies and cream cheese until well combined. Roll cookie mixture into 1” balls and place on a wax paper-lined baking sheet. Freeze for 15 minutes. Melt candy in a microwave-safe bowl according to package directions. Working one at a time, dip truffle into candy and return to the baking sheet. Allow to dry. Redip truffle allowing excess to remain (this will help to give it a textured look like a cabbage). Return to baking sheet. Once dry, store in an airtight container in the refrigerator. When ready to serve, place candy in two green mini cupcake liners turned opposite ways to give an additional “leaf” effect. Wash and dry strawberries leaving stems on. Melt candy melts according to package directions. Holding strawberries by the stem, individually dip them into melted candy turning gently to coat. Shake strawberry over the bowl to remove excess candy. Place on wax paper-lined baking sheet to dry. Spoon excess melted candy into one corner of a plastic sandwich baggie. Using scissors, snip the tip of the baggie and gently drizzle over the ‘carrots’ from side to side. Refrigerate until read to serve. 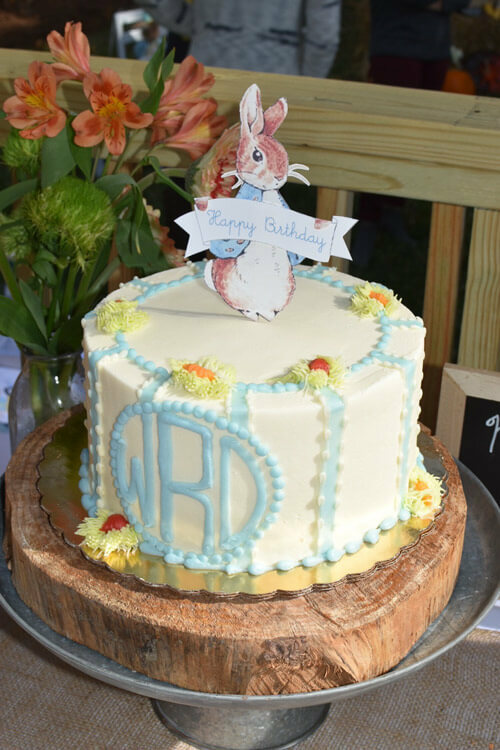 Want to see all of the pictures from the fun Peter Rabbit birthday party? Click “Photos” below (next to “Comment”) to scroll through the entire album. 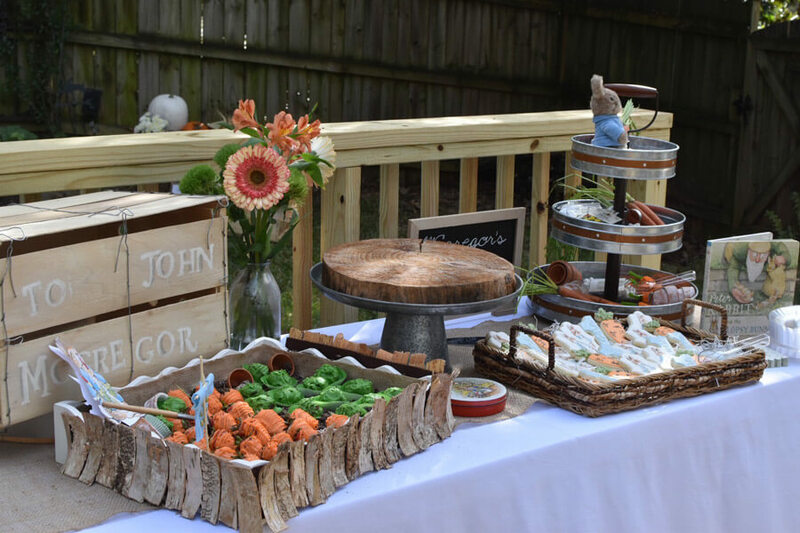 If you love this idea and want to continue seeing more party inspiration, let me know! I love to hear from you. If you have any questions about the party, leave them in the comments and we’ll be sure to get back to you!